No single book, or expert, or field could fully explain the problems of hillbillies in modern America. Our elegy is a sociological one, yes, but it is also about psychology and community and culture and faith. The language spoken by the American ruling class—the technocratic elite—is one driven by statistics. Statistics are necessarily concerned with the measurable aspects of people’s lives—with things like GDP, income, employment rate, educational tests scores, and so on. This is all that public policy makers and Ivy League wonks can ever speak about. It is the language of our national institutions—of our politics, schools, justice system, etc. Yet because it only concerns the outside of people’s lives, this language can never speak to our most human needs. It can never really explain why we do what we do, and it can never fulfill us in the way that our deeper cultural institutions (art, family, religion, etc.) can. One need look no further than the surprise among most over the Trump victory (including yours truly, though I was not shocked to see a close race). The polls were wrong, the pundits were wrong, every metric was wrong. Especially concerning the Rust Belt. 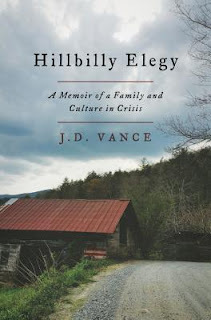 Every statistic in the world couldn’t account for the fact that Vance’s hillbillies felt a special kinship with Trump, that he was speaking to them and tracing their own narrative of disappointment in his speeches. No matter that Trump is one of the richest men in the country, a Manhattan socialite if there ever was one—he was able to connect where it mattered with the kinds of folks Vance writes about. Clinton, the ultimate technocrat, credentialed to the eyeballs and poised to steer the American machine into the far reaches of Progress, failed because she couldn’t tap into the right kinds of narratives. Bernie Sanders did tap into those narratives, and I’m not the only one to think that he would have had a better shot in the Rust Belt against Trump. Huckster though he may be, Trump knows that politicians need to speak to the personal aspects of people’s lives, and they do that by telling stories, and linking their own vision to the common stories of the people. Does this mean that good politicians need to be demagogues like Trump? I don’t think so, though demagoguery is always a potential problem in a democracy, and especially in a democracy in the age of social media. One thing to take away from this election is that human nature isn’t as malleable as perhaps the progressives had assumed. Or at least not as easily massaged into seats for the ride to the future of Progress. People naturally resist being told what is good for them by a cadre of experts, and can only stand it so long when what those experts are telling them is good doesn’t mesh with what they experience in their communities and in their bank accounts—think of the blue-collar resistance to things like globalization or foreign policy or Obamacare or the push for genderless bathrooms. What does technocracy have to say to people’s gut feelings, or the value of tradition and custom in shaping communities? Nothing. And so, over the past few decades, we’ve had a gap open up between the kinds of things the elite in our country spoke to and what people feel inside and how they live their lives from day to day. Perhaps this gap was hard to notice at first, but it grew increasingly wider, and Trump came along and exploited it to his advantage. I recently read a book that explains exactly what this looks like, this distance between the technocratic utopia and the way people really live, as it plays out in public school classrooms. The book is called Substitute, by the writer Nicholson Baker, and in it he recounts his observations during his time working as a substitute teacher in a school district near his home in Maine. Baker is a meticulous observer (the book is very detailed and over 700 pages long), and he paints a vivid picture of a school system that attempts to train the future technocrats of America by filling them with information, teaching them skills, and, above all else, keeping them busy throughout day. In Baker’s school, kids spend most of their day on iPads, flitting from one activity to the next, and most teachers are managers, patrolling the classrooms while helping students with various tasks. Most of these activities have to do with memorizing information, or filling out charts, or analyzing text or data. If kids finish working early, they watch videos on their screens until the bell rings. There’s always a din that threatens to erupt into chaos, and teachers spend most of their days yelling “Guys!” to tilt the balance of noise back to a tolerable level. There are a few moments in the book when a teacher achieves a genuine attention in the classroom, when the students are quiet not because they’ve been yelled at but because they are captivated by what the teacher is doing. Several of these occasions, Baker notes, are when students are read to. He is floored when one particularly difficult grade-school class sits in silent wonder while he reads a Roald Dahl story to them. The whole day he had been desperately trying to get them to pay attention while he ran through a litany of activities with them; now they were rapt. As the book goes on the reader realizes that these moments of engagement with stories are far and few between. Most of the time students are reading gaggy informational texts, some of which are worked into clunky narratives in the style of SAT reading comprehension questions. Students naturally recoil from this kind of beauty-less education. Baker’s book shows this—they hate the bureaucratic assignments (charts filled out, worksheets pencil-whipped, projects completed and graded according to a rubric) and desperately want to listen to and tell each other stories. This need for stories, in my mind, accounts for all the background noise that teachers are constantly fighting. When students are bored by a skull-numbing worksheet or foolish activity designed to divert their attention from the fact that what they’re doing is not interesting in its own sake, they turn to each other and start gabbing about their own exploits, or someone else’s. In other words, when a teacher does not engage them with stories, they provide their own. We need beauty in order to give us purpose, to stir in and draw forth from us our natural desire to learn, and it is clear that our modern educational technocracy does not provide it. Only a few books, and even fewer works of fiction, are mentioned in Baker’s observations; most involve activities that students can complete without reading the books themselves. On a day-to-day basis, English classes in public schools do not ask students to immerse themselves in a work of literature and discuss it, period. I know—I taught out of a public-school textbook for many years, and teachers have to work against the fragmented nature of the curriculum to clear an activity-free space for the simple act of close reading and discussion of a full work of literature. Think about that for a moment. This is what I mean by the disconnect between technocratic goals and people’s lived experience. Humans were not built for this kind of data-driven existence, and the younger ones among us (i.e. Baker’s students) are not as practiced in the art of hiding their frustration as we civilized adults are. So in Substitute we see the friction between a story-less pedagogy (dare I say soul-less?) and the human need for transcendent art; in the recent election we saw the friction between the message sold by the model technocrat and the blue-collar workers (who until very recently were in the pocket of this technocrat’s party) who decided to take their chances with the candidate who spoke to them in stories that they could sink their teeth into. My review of Baker’s book is forthcoming in a Catholic publication; I’ll post the link here when it runs. For more of my thoughts on the issues surrounding technocracy, education, and stories, see my posts on Silicon Valley, on Eros in education, and on the difference between Big Data and narrative.